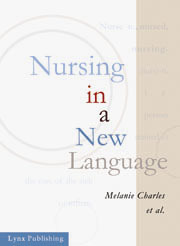 Nursing in a New Language is not intended to teach students nursing. Rather it is designed to assist nursing students in mastering adequate English language skills specific to the nursing environment. 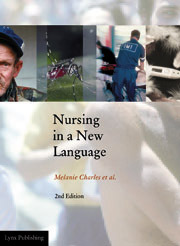 Through a combination of reading texts, writing exercises, conversation practice and "Clinically Speaking" exercises, Nursing in a New Language addresses subjects ranging from nutrition to hospice care, from a nurse's first encounters to tips for interacting with doctors, from SARS to ER, and will help students become more familiar with the language, slang, and idioms often used in a health care environment. Audio CDs are available to help train students with pronunciation and listening skills. It is a must for both classroom and self study.